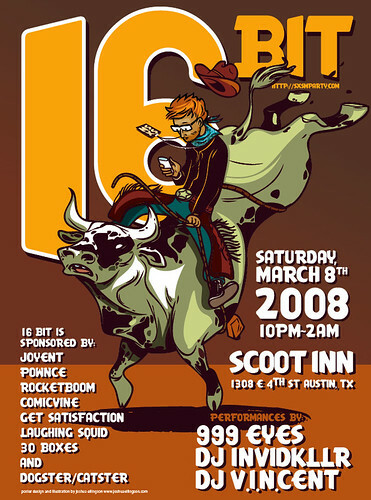 Performances by 999 Eyes, DJ Invidkllr and DJ V.I.N.cent. Sponsored by Joyent, Pownce, Rocketboom, ComicVine, Get Satisfaction, Laughing Squid, 30 Boxes and Dogster/Catster. Twice as much fun as last year? Nah, 2^16 / 2^8 = 256 times as much fun. My god, how could I skip this? is this at the same scary, hard to get to location that it was last year? @veronicabelmont, yes, only there will be a such a line of geeks from scoot to downtown that a squirrel could hop all the way from techie dome to dome without hitting the ground. are there squirrels in austin? oh, veronica. that wasn't scary -- that was fun! plus, you can always grab 4 friends and share a taxi. and, yes, narendra, there are squirrels. texas-sized squirrels. This was all kinds of awesome last time! Can't wait. Or, you know, you could share a shopping cart. so bummed to miss it. Next year. This was the best party at SXSW last year. Can't wait! Dunno how you're gonna beat lightsaber limbo and Galaga ... but I'll be there to find out. lane, there must be cupcakes. Will be sportin' the 16bit shirt. Keep it real. Bringing my daughter (adult, of course). Great party. Agree with Veronica on the location. Scary? It was dark, but I didn't know it was scary until the cab driver who drive us there insisted that we don't walk the 6 blocks back to the hotel. Hopefully all the geeks will protect eachother from the boogey-man. It was also the only party I remember that had Session Lager, in my favorite little red-label 11 oz. bottles. Good call, barkeep. Hey, all-- if you're planning on attending the party, but you don't have an SXSW Interactive badge, never fear: Ask nicely, and I'll put your name on the list. I was born in Austin and its a very sad perception that people have of the city when they walk East of the "tracks". Austin is culturally segregated by the I-35 expressway which is one block away from the convention center. The "East Side" has a lot of hispanic people but it would be terribly unfortunate to be afraid of that. The venue is just 4 or 5 blocks from the convention center and the walk has a beautiful view of downtown and the open sky. Another great taste of Austin if anyone gets a chance is Barton Springs. Just take the river trail to Zilker park. Awesome Austin experience. I think I'll be just fine "East of the Tracks". Go ExSE young interneter , ye can't miss it. I don't really get it. What is the "I'm attending." for? That doesn't really put me on any guestlist? Laughing Squid is just so great! I wish I could have been there to support this.